Definition at line 108 of file app-layer-smtp.h. Definition at line 148 of file app-layer-smtp.h. Definition at line 146 of file app-layer-smtp.h. Definition at line 153 of file app-layer-smtp.h. 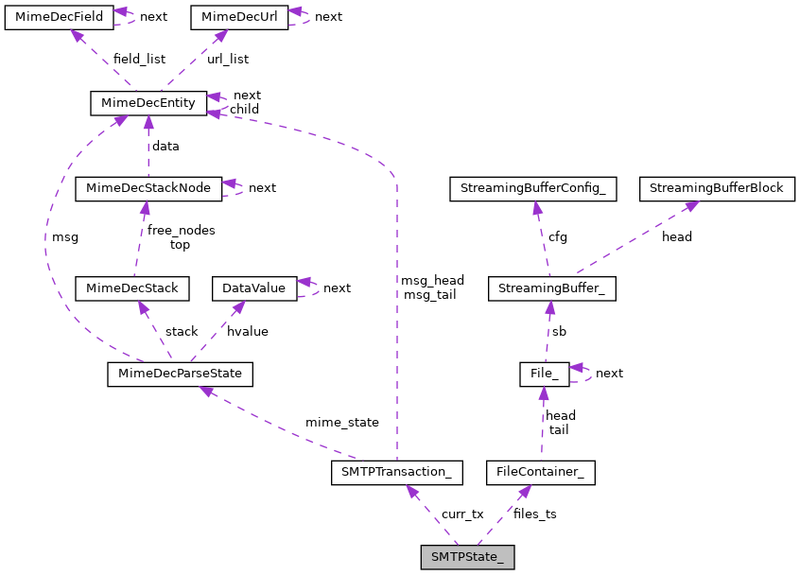 Referenced by SMTPParserCleanup(), SMTPProcessDataChunk(), and SMTPStateAlloc(). Definition at line 155 of file app-layer-smtp.h. Referenced by SMTPProcessDataChunk(), and SMTPStateAlloc(). Definition at line 157 of file app-layer-smtp.h. Definition at line 160 of file app-layer-smtp.h. Definition at line 109 of file app-layer-smtp.h. Definition at line 144 of file app-layer-smtp.h. Definition at line 120 of file app-layer-smtp.h. Definition at line 123 of file app-layer-smtp.h. Definition at line 122 of file app-layer-smtp.h. Definition at line 116 of file app-layer-smtp.h. Definition at line 164 of file app-layer-smtp.h. Definition at line 167 of file app-layer-smtp.h. Definition at line 168 of file app-layer-smtp.h. Definition at line 114 of file app-layer-smtp.h. Definition at line 115 of file app-layer-smtp.h. Definition at line 142 of file app-layer-smtp.h. Definition at line 129 of file app-layer-smtp.h. Definition at line 131 of file app-layer-smtp.h. Definition at line 127 of file app-layer-smtp.h. Definition at line 128 of file app-layer-smtp.h. Definition at line 137 of file app-layer-smtp.h. Definition at line 139 of file app-layer-smtp.h. Definition at line 135 of file app-layer-smtp.h. Definition at line 136 of file app-layer-smtp.h. Definition at line 111 of file app-layer-smtp.h.